An executive order signed by President Donald Trump imposes a blanket ban on all Syrian asylum seekers until “sufficient changes” are made to the refugee program, while barring entry to the citizens of some Arab countries for three months. 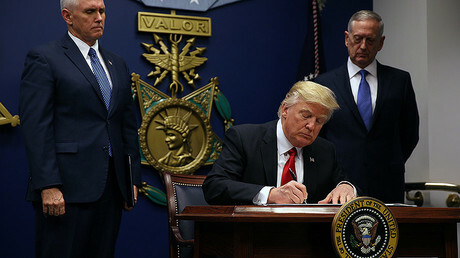 "I hereby proclaim that the entry of more than 50,000 refugees in fiscal year 2017 would be detrimental to the interests of the United States, and thus suspend any such entry until such time as I determine that additional admissions would be in the national interest," the executive order says, according to the text published by The New York Times. While no Syrian refugees will be allowed to enter the US for an indefinite period, the order also calls for a pause in all refugee admissions for at least 120 days, or four months. Citing US national security concerns, President Trump’s order also barred entry to foreign citizens from some Arab countries for 90 days, or three months. No countries except Syria are mentioned in the order, but the text refers to a statute that would apply to six other Muslim-majority nations: Iraq, Sudan, Libya, Somalia, Yemen and Iran, Reuters reports. There are some exceptions for certain types of visas, however, including those for diplomats and the UN. “I’m establishing new vetting measures to keep radical Islamic terrorists out of the United States of America. Don’t want them here,” Trump said at the Pentagon earlier on Friday, as quoted by Reuters. “We only want to admit those into our country who will support our country and love deeply our people,” the president added. Eventually, refugee status will be granted to Syrians, but first priority will go to those who faced religious persecution. Trump signaled that Christians in Syria would potentially receive priority status in an interview with the Christian Broadcasting Network on Friday, according to Reuters. "If you were a Muslim you could come in, but if you were a Christian, it was almost impossible and the reason that was so unfair, everybody was persecuted in all fairness, but they were chopping off the heads of everybody but more so the Christians," Trump said. House Speaker Paul Ryan (R-Wisconsin) issued a supportive statement, saying, "Our number one responsibility is to protect the homeland. We are a compassionate nation, and I support the refugee resettlement program, but it's time to reevaluate and strengthen the visa vetting process." 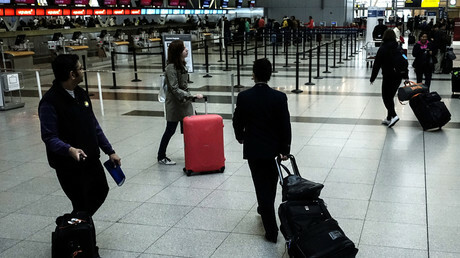 The order took effect immediate, leading to “chaos” for Arab-Americans whose family members were already en route for a visit, the legal and policy director for the American-Arab Anti-Discrimination Committee, Abed A. Ayoub, told Reuters. Eleven Nobel laureates and thousands of other renowned academics have signed a petition opposing the order, calling it discriminatory and detrimental to national security. One of the petition’s organizers said on Friday that about 10 emails a minute have been pouring in, while noting 15 to 20 volunteers are working on adding signatures. “I am heartbroken that America is turning its back on a proud history of welcoming refugees and immigrants – the people who helped build your country, ready to work hard in exchange for a fair chance at a new life,” she said. The 19-year-old Pakistani activist, who won the Nobel Peace Prize in 2014 and now lives in the UK, gained international recognition in 2012 when the Taliban shot her in the head for promoting education for girls. The order has caused “outrage and grave concern for the well-being of all our communities,” said Fahd Ahmed, the executive director for DRUM (Desis Rising Up and Moving), a group that advocates for the rights of South Asian immigrants in the US. “At least three of those countries – Syria, Iraq, and Yemen – are currently in the middle of extreme conflicts and many of the people from those countries are seeking refuge and safety,” he told RT, adding that there is also concern for immigrant communities in the US. There are possible domestic consequences that come with such a migrant policy, he said, explaining that “just the very notion, the very premise, of the executive order [stating] that we are going to keep immigrants and refugees out essentially makes a direct correlation between refugees, immigrants and terrorists. That has an impact here locally and domestically, because it provides an official stamp that Muslim communities, communities from these countries, are legitimized as targets to be suspicious of, and that's what directly leads to increased targeting by immigration [officials] and police, and hate crimes,” Fahd Ahmed told RT America.